Recent discoveries about wild chimpanzees have dramatically reshaped our understanding of these great apes and their kinship with humans. We now know that chimpanzees not only have genomes similar to our own but also plot political coups, wage wars over territory, pass on cultural traditions to younger generations, and ruthlessly strategize for resources, including sexual partners. 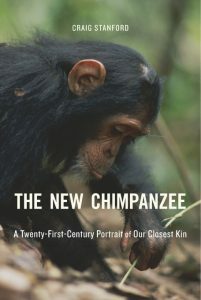 In The New Chimpanzee, Craig Stanford challenges us to let apes guide our inquiry into what it means to be human. With wit and lucidity, Stanford explains what the past two decades of chimpanzee field research has taught us about the origins of human social behavior, the nature of aggression and communication, and the divergence of humans and apes from a common ancestor. 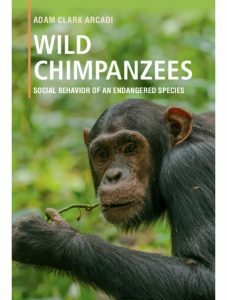 Drawing on his extensive observations of chimpanzee behavior and social dynamics, Stanford adds to our knowledge of chimpanzees’ political intelligence, sexual power plays, violent ambition, cultural diversity, and adaptability. The New Chimpanzee portrays a complex and even more humanlike ape than the one Jane Goodall popularized more than a half century ago. It also sounds an urgent call for the protection of our nearest relatives at a moment when their survival is at risk. Mammals of southern, central and east Africa: a photographic guide. The guide has key identification features showing how to differentiate between similar species, and distribution maps and a list of major parks and reserves. Artist/Author: Stuart, Chris amd Tilde Stuart. OUT OF PRINT. A photographic field guide to the larger mammals of one of the most fascinating regions in the world. Stunning colour photography depicts more than 100 species found in a region spanning from Morocco in the west to Iran and the Arabian Peninsula in the east. All major families are represented, with mammals from the diminutive Least Weasel to the impressive Asiatic Black Bear and including iconic species such as the Arabian Oryx and Arabian Leopard. Information for each species includes a detailed description with key ID features, distribution, habitat and status, behaviour, diet and reproduction. An introduction provides useful background on regional geography and vegetation. Originally published in 2004, the Kingdon Pocket Guide to African Mammals quickly became the field guide of choice to take on African safaris. Its compact format makes it ideal for use in the field, while its coverage is the most comprehensive currently possible in this format. 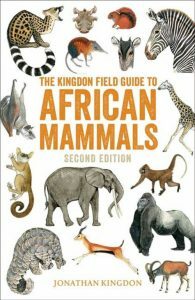 Adapted from the Kingdon Field Guide to African Mammals, the greatly condensed text focuses on essential information such as identification and distribution, while the author’s superb illustrations have been rearranged into an easy-to-use plate format and placed opposite the text. Complex and more obscure groups like the bats and certain rodent families are summarised by genera. Over 500 maps plot the distribution of all larger species, and for smaller mammals the maps show distribution by genus. This is a completely revised second edition of this popular guide. The information and taxonomy have been updated to follow the newly published second edition of the Kingdon Field Guide to African Mammals (2015), and this new edition of the pocket guide contains several new species and illustrations. The maps have been completely replaced and there are now 200 more maps than in the original edition. 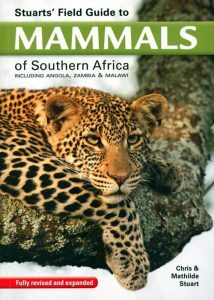 Stuarts’ field guide to mammals of Southern Africa: including Angola, Zambia and Malawi. Artist/Author: Stuart, Chris and Mathilde. This is a fully revised edition of the Stuart’s best-selling field guide to southern Africa’s mammal species. From tiny shrews to the iconic Big Five, this guide covers all species found in this region, including those off the coast. Clear, detailed text, distribution maps and colour photographs enable quick identification, while also providing information on diet, habitat, habits, and silhouettes of tracks and skulls. This new edition brings all information up to date, along with revised distribution data and many new photographs. Its coverage is expanded to include Angola, Zambia, Malawi and northern Mozambique. Jonathan Kingdon’s landmark field guide has now been fully revised and updated to include many newly recognised species and recent changes in classification. 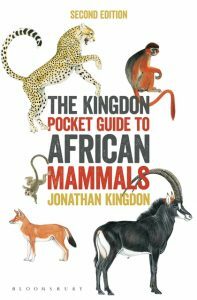 Jonathan Kingdon, one of the world’s foremost authorities on African mammals, has both written and illustrated this landmark field guide. The unique combination of his extensive field experience and artistic talent has produced a stunning work that sets new standards. All known species of African land mammal are covered, with coverage of several of the more complex groups of small mammals simplified by reference to genera. Classification has been fully updated and this new edition includes many newly recognised species. With over 780 colour illustrations, numerous line drawings and more than 520 maps, this book will be an essential companion to anyone visiting Africa or with an interest in the mammals of the continent. The concise text provides full information on identification, distribution, ecology, relationships and conservation status, with introductory profiles that summarise the characteristics of each mammal group. All known species of African land mammal are covered, with coverage of several of the more complex groups of small mammals simplified by reference to genera. With over 500 colour illustrations, numerous line drawings and more than 500 maps, this book will be an essential companion to anyone visiting Africa or with an interest in the mammals of the continent. Artist/Author: Foley, Charles et al. Home to the Serengeti National Park, Ngorongoro Crater, and Mount Kilimanjaro, Tanzania offers some of the finest big game watching in the world, from elephants and rhinos to chimpanzees and lions. 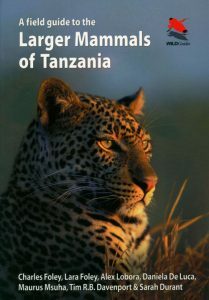 This field guide covers all the larger mammals of Tanzania, including marine mammals and some newly discovered species. Detailed accounts are provided for more than 135 species, along with colour photographs, colour illustrations of marine mammals, and distribution maps. Accounts for land species give information on identification, subspecies, similar species, ecology, behaviour, distribution, conservation status, and where best to see each species. The guide also features plates with side-by-side photographic comparisons of species that are easily confused, as well as first-time-ever species checklists for every national park. The definitive, most up-to-date field guide to the larger mammals of Tanzania, including marine mammals. It features detailed species accounts and numerous colour photographs throughout. It provides tips on where to see each species. It includes species checklists for every national park. Mammals of Southern Africa and their tracks and signs. Artist/Author: Gutteridge, Lee and Louis Liebenberg. The ability to accurately read difficult, partial, or little-seen signs left in the soil or sand is rare and largely the domain of professionals. However, by making use of this comprehensive guide, anyone can begin to decipher these natural hieroglyphs etched on the ground. In this volume, highly accurate sketches of animal tracks are combined with a wide selection of extremely varied photographs that provide an all-round impression of the signs the animals may leave behind. 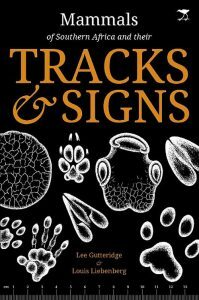 This field guide to mammal tracks and signs also serves as an ID guide to the mammals of southern Africa as full colour photographs of each animal are included. 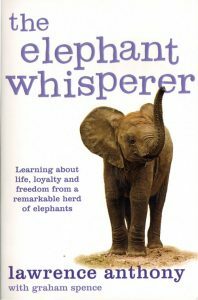 Elephant whisperer: learning about life, loyalty and freedom from a remarkable herd of elephants. Artist/Author: Anthony, Lawrence and Graham Spence. When South African conservationist Lawrence Anthony was asked to accept a herd of ‘rogue’ elephants on his reserve at Thula Thula, his commonsense told him to refuse. But he was the herd’s last chance of survival – notorious escape artists, they would all be killed if Lawrence wouldn’t take them. He agreed, but before arrangements for the move could be completed the animals broke out again and the matriarch and her baby were shot. The remaining elephants were traumatised and very angry. As soon as they arrived at Thula Thula they started planning their escape…As Lawrence battled to create a bond with the elephants and save them from execution, he came to realise that they had a lot to teach him about love, loyalty and freedom. Set against the background of life on the reserve, with unforgettable characters and exotic wildlife, this is a delightful book that will appeal to animal lovers everywhere. Smithers’ mammals of Southern Africa. 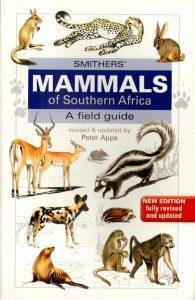 First published in 1986, “Smithers’ Mammals” is an authoritative and popular guide to the mammals of Southern Africa. This revised and updated edition incorporates the latest information brought to light by molecular genetics, while remaining accessible to the layperson and handy in the field. Each entry includes an in-depth species description, notes on habitat, behaviour, diet and conservation status, accurate illustrations and spoor drawings, and a distribution map. The book also details the whales, dolphins and seals seen along the Southern African coast.